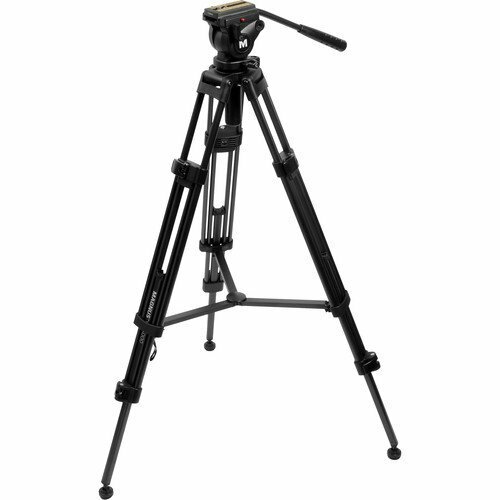 The Magnus VT-4000 Tripod System with Fluid Head is a stable, sturdy video tripod made from anodized aluminum that can support loads up to 8.8 lb. Overall, this tripod offers many features usually only found on more expensive models. The two-way fluid head provides smooth operation, and features a half-ball mount with a diameter of 65mm, with left and right pan bar mounts. It comes supplied with one pan bar. In addition, unlike most other heads in its class, all the head controls are positioned on the left side of the head, which leaves your right hand free for the panning handle. The VT-4000 tripod system weighs 7.9 lb. 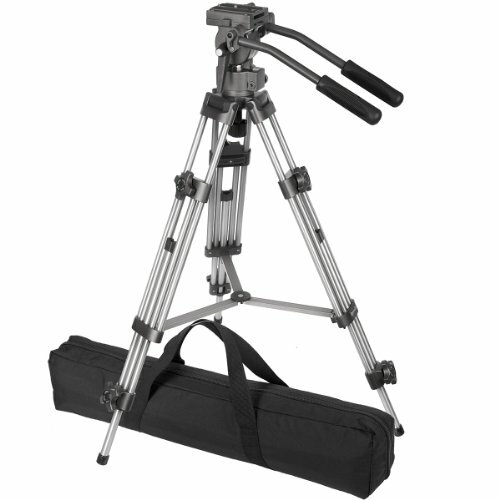 Its 2-stage leg design allows you to adjust the height of the tripod from 27.6" to 59". A middle spreader and passive counterbalance provide enhanced stability to the entire system. The VT-4000 also has separate pan and tilt locks, and a bubble level for precision leveling. The fixed counter-balance spring incorporated in the head will help with smoother tilt movements. Its provided quick release plate features a standard 1/4"-20 mounting screw with a video pin, and has a sliding range of +20/-25mm - to enable travel capabilities - essential in balancing uneven configurations. The head's tilt angle is adjustable from +90° to -60°. 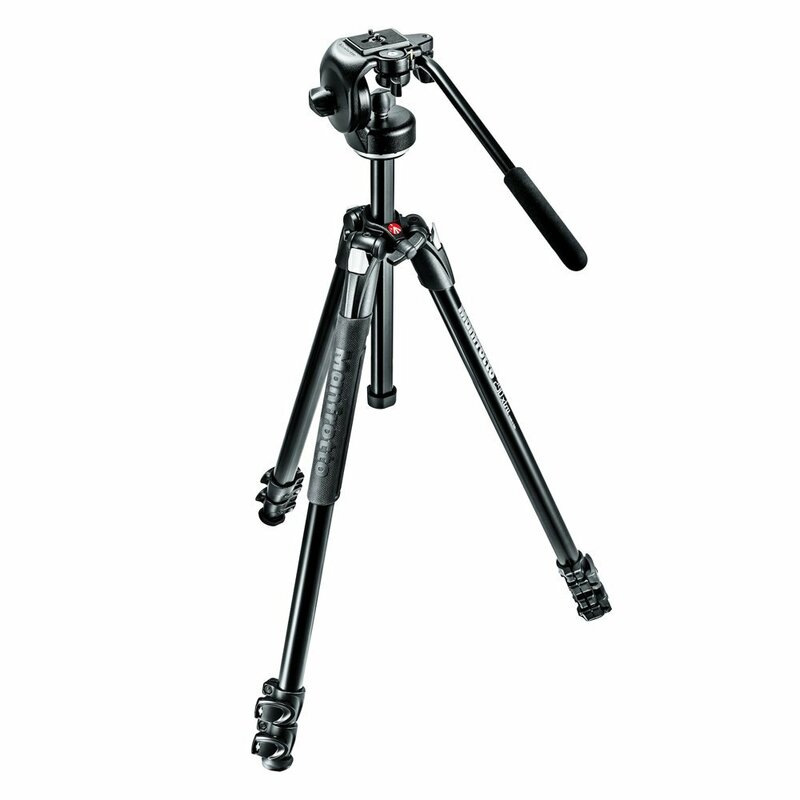 The 3021BN is one of the most versatile and popular tripods in the Manfrotto range. This reed version is lightweight and portable enough to take in the field, yet strong enough for a medium format camera, small view cameras, spotting scope and the latest generation of digital video cameras. The Ravelli AVTP professional tripod is a high performance, fluid drag tripod that provides smooth continuous drag control and operates on both pan and tilt axis with independent pan and tilt locks. The Ravelli AVTP tripod head features finely machined aluminum parts for precise positioning with smooth, definite action. The fluid head is comprised of titanium line components for years of durability and utilizes full two way action allowing you to isolate the plane of motion and make precise adjustments to your compositions. The head features dual continuous drag fluid movement for both 360 degree pan and 180 degree tilt as well as dual handles for more precise control.